I’ve been using ffmpeg to trim clips from a trail camera, as most of the time there’s only a few seconds of anything interesting in frame out of the 30+ seconds of video it records each time, but I don’t want to re-encode them and lose video quality as a result (or balloon file sizes tremendously with a lossless video coding). Keeping the whole 30 seconds is not just unnecessary and makes viewing the videos much more tedious, but wasteful of storage space as the encoding quality from the trail camera is very inefficient (file sizes are many times larger than they should be for the quality – clearly the H.264 encoder used in the trail camera is very cheap and very bad at its job). ffmpeg -ss 00:07 -t 00:03 -i "IMG_0164.MP4" -async 1 -c copy "IMG_0164_TRIMMED.MP4"
The resulting trimmed MP4s play just fine in Quicktime, the Finder – anywhere that uses Apple’s decoding libraries (though I didn’t test iOS). However, in VLC, or Lightroom, the audio is completely corrupt – just incoherent noise. In Lightroom the video doesn’t even play correctly, because of Lightroom’s stupid habit of re-encoding the video & audio into internal caches – apparently their video decoder is somehow thrown off by the audio channel issues, too. After much trial and error and many dead-ends (thank you completely bogus & wrong Stack Overflow threads… sigh) I eventually realised that the problem is apparently simply that Lightroom, VLC, etc get offended when you include pcm_s16le audio in an MP4. ffmpeg itself says that’s not a valid audio codec for the MP4 container, iff you explicitly tell it to use that as the codec. If you’re just copying from an existing audio / video file, however, it makes no mention at all of the concern. Sigh. So the apparent solution is simply to switch to the MOV container format instead. ffmpeg -ss 00:07 -t 00:03 -i "IMG_0164.MP4" -async 1 -c copy "IMG_0164_TRIMMED.MOV"
The encoded bits remain identical, but the MOV container apparently accepts PCM audio where MP4 does not. VLC, Lightroom, etc are now happy (and Quicktime et al remain happy). It’s frustrating that VLC & Lightroom can’t handle this when clearly it’s technically possible (witness Quicktime), and worse they don’t even properly recognise that they’re not handling it properly – they just play completely corrupt audio that’s literally painful on the ears. It’s also very curious that the trail camera uses PCM audio if that’s not valid in an MP4 container. It’s downright bizarre that VLC & Lightroom can play the unmodified MP4s straight from the trail camera, even though they use the same purportedly invalid audio codec… somehow something ffmpeg is doing during its transmutation is making them angry. I was unable to determine what that might be, though, through trial-and-error with ffmpeg command line options & rudimentary examination of the input & output files. P.S. An alternative is to bitwise-copy only the video stream (i.e. change -c copy to -c:v copy), and let VLC transcode the audio into its default AAC for the MP4 container. That probably wouldn’t be a problem for me in my case – the audio from trail cameras is pretty crappy to begin with – but at the same time the audio tracks in these files are insignificant in size, so re-encoding them (and lossy as AAC) is pointless to saving disk space. Long story short, the issue turns out to be having connection logging enabled. That’d been turned on many months before in order to debug a different stupid Mail bug, and had been simply left on (deliberately IIRC, since Mail tends to bug-out quite often, so why not have logs already available when it comes time to debug it yet again?). Connection logging is enabled or disabled by opening the “Connection Doctor” (Window menu > Connection Doctor) and using the checkbox titled “Log Connection Activity”. So how do you get to that checkbox when Mail crashes on launch? Well, in this specific instance I was able to disable all mail accounts via System Preference’s Accounts pane, launch Mail, disable logging, quit Mail, re-enable all mail accounts via System Preferences, and then relaunch Mail to have it finally actually work. From even just brief web searching, it’s clear that this issue has been present and well-known in Mail for a really long time. Sigh. Apple’s protestations that they care about software quality, or the Mac, are relentlessly undermined by their actual actions. Most common photo editors – e.g. Lightroom – let you choose the colour gamut to use for exported photos. In Lightroom (at time of writing in January 2018) you have a fairly short list, of today’s common options – sRGB, Display P3, Adobe RGB, and ProPhoto RGB. Since we’re all obsessive nerds, that we’re given an option dictates that we must make an explicit choice. More pragmatically, the default in Lightroom – and many other photo editors – is sRGB, which is the one option that’s definitively wrong, so in this case you really do have to change it to something else, if you care about image quality at all. So, what should you choose? Well, obviously you want your exported photos to maintain as much of the colour gamut they contain as possible, and as accurately as possible – as part of the general principle that you want it to be the highest quality and as close to what you see on your screen as possible. 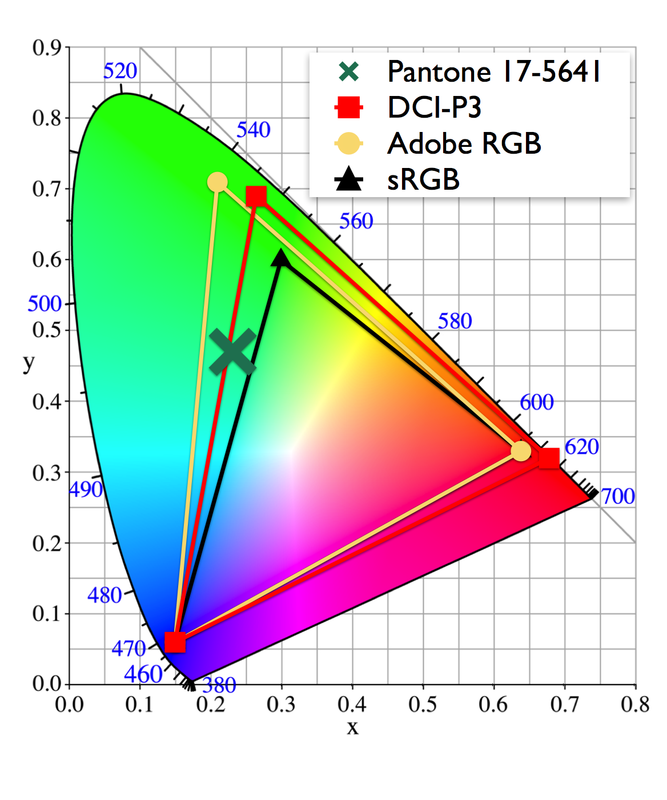 Modern digital cameras are capable of capturing far more than the sRGB space, and modern displays are also capable of larger gamuts too (typically Adobe RGB or Display P3, at time of writing, if not the union of both). Thus why sRGB is unequivocally the wrong option (and any purported counter-arguments about colour calibration issues in web browsers and so forth are moot, because all decent web browsers handle colour management correctly & intuitively, and anyone not using one of those browsers clearly doesn’t care about a lot of things, least of all colour accuracy). So then it’s just a question of which colour space is bigger, right? That’s easy – ProPhoto RGB is huge. A complete superset of all the others. It actually encompasses colours that don’t even exist as far as the average human is concerned, because they’re outside our visual range. So just use that, right? The thing is, if you increase the colour gamut you encode your image in, you reduce the precision of your colours, all other things being equal. Because you’re taking e.g. 8 bits, so 256 possible values, and spreading them out over a wider spectrum. Thus each “bucket” – digitally quantised colour – is going to be bigger, coarser, and have a wider margin of error. What this can mean in practice is visible banding in images which “should” be higher quality, because they have a much bigger colour gamut! Larger colour gamuts really need correspondingly larger bit depths, in order to avoid sacrificing colour accuracy (or in plain terms, to avoid visible banding or posterisation). Thus, if you’re exporting as ye ol’ JPEGs (an image format that’s just not very good, though it’s had a good run at over twenty-five years old at this point) where you’re stuck with 8 bits per pixel, it’s probably a bad idea to use ProPhoto RGB. It’s too likely that in practice you’ll see nasty banding. Instead, you’re probably better off striking a compromise and choosing either Display P3 or Adobe RGB, which aren’t so much bigger than sRGB that banding is often more visible, but are fully representable on many contemporary displays. In theory as displays get better – i.e. wider gamuts – you’d want to upgrade, but in reality JPEG should be long dead before we get the next significant jump in real-world display gamuts, and their successor format(s) will undoubtably support much higher bit depths, eliminating this trade-off. On the other hand, if you’re already exporting in modern formats – e.g. HEIF – where 10-bit (or better) bit depths are supported, you can consider extra large gamuts like ProPhoto RGB (just make sure you then use greater bit depths, as HEIF also supports 8-bit channels, and some software will still default to that). It becomes more of a question of your target audience, your expectations for the longevity of that particular rendering of the photo, etc. And if you’re using 16-bit colour depths, such as are options for TIFFs or other typical intermediary formats (e.g. when going from Lightroom to Photoshop, or vice-versa), then ProPhoto RGB is the best option, because there are no practical downsides. Today ProPhoto RGB probably far exceeds the colour gamut your camera(s) can actually capture, but that’s okay – your camera(s) can probably capture more than just Adobe RGB or Display P3 too, and with 16 bits per pixel you’ve got plenty of colour resolution, so why sacrifice your camera’s capabilities?